Today is a good day to burn 🔥 🔥 🔥 your old stories. The stories you tell yourself in areas of business & life where things aren’t as you want them to be. Those stories you tell yourself about WHY it’s not as you want it to be…. 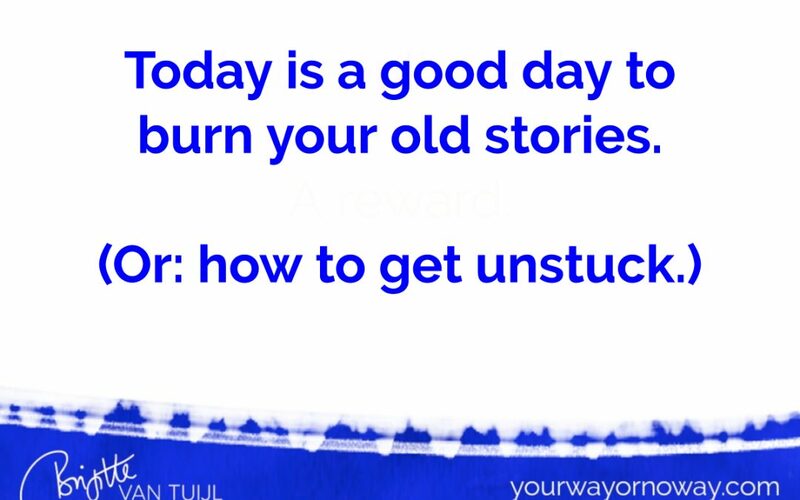 are the stories that keep you stuck exactly where you are…. Or whatever variation on these stories you tell yourself – and keep yourself stuck with. Why don’t I have …..(insert whatever you want but don’t have) yet? Write down ALL the reasons you can think of. ALL these reasons, no matter how rational they seem, are the exact stories that keep you where you are. Make yourself comfortable. Close your eyes. See in your mind’s eye a violet flame before you. See yourself throwing these stories in that violet flame. Watch them burn. Throw in everything you no longer want to believe. Every thought that no longer serves you. Then, it’s time to write new stories. ☀️ Of why you CAN do it. ☀️ Of why you CAN have it. ☀️ Of how miracles exist and magic is real and you are worthy and all is well. Stories that make you feel good. Stories that you choose to believe. Then, live as if these new stories are already true. Day in, day out. And one day, you will see that they ARE. You feel better than you do right now. Burn those old stories, baby.